The beat down of the Georgia football program has continued for yet another full day. On blogs, in columns and on sports talk shows, there has been more talk about the poor showing of Georgia Saturday as opposed to the victory by South Carolina. Granted, I have heard plenty regarding the fact that Steve Spurrier is the Second Coming, and that the Gamecocks are the next Alabama, but the majority of the 'talk' has been regarding the Bulldogs play, or lack thereof. First, regarding Carolina, I say to the victor belong the spoils. They went out and earned the right to be put on the pedestal. My hat is off to them. And along the same lines but on the opposite end of the spectrum, Georgia deserves to be raked across the coals. 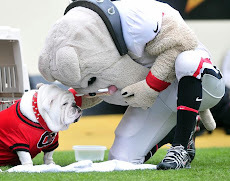 As an avid Dawg fan, and after 48 hours of contemplation, I have come to the conclusion that what i hate most about the blow-out loss Saturday night is the fact that no one in the country takes our program seriously anymore. 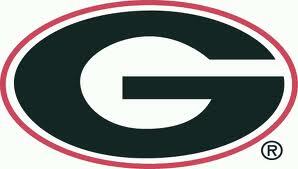 We now carry the stigma that a Mark Richt team can't win a big game. What's even worse, most of those same people don't think Georgia can even show up and compete in a big game. Our record shows that their beliefs are justified. In the words of the late Rodney Dangerfield, "we can't get no respect". But we haven't earned that respect because we haven't won that big game in probably five years now. I hate that terribly for Richt, but I hate it even more for our program. The only way we get that respect back, and yes we used to have it, is to play well in an important game. Notice I did not say win the game, because we have to prove we can be competitive on that stage before we can win. 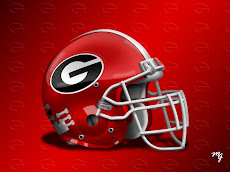 I've always looked at the Georgia program as being steeped in heritage, and it really stings for us to be viewed as a second rate football team. 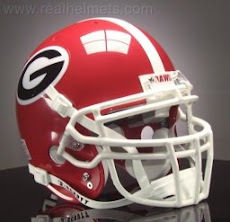 The upcoming Florida game might present for us the opportunity to begin removing this negative image of Georgia Bulldog Football. We have to go to Jacksonville and play well and compete for sixty minutes. If we can do that I'll take what the scoreboard gives at the final buzzer. I do not want perception to continue to be reality. 1. Other than media hype what lead you to believe UGA was in the same league with USCjr and or AL etc? 2. What top team last year or this year did our D totally dominate? 3. What front 7 has our O line dominated this year? 4. Since Stafford left what QB has beaten a top 10 team on the road? 5. How do you win when your AA safety has a WR take an interception from him and your AA LB follows the fake to Lattimore instead of containing Shaw? Losing is hell, but maybe just maybe all of us bought into media hype instead of taking a real look at the team we have. I hope an pray that we are good enough to beat UF, AU and GT and if so we can then evaluate how good this team and this coaching staff really is. Anonymous: I never thought we were on a level with 'Bama. I did think we had the athletes to play with Carolina though. I was guilty of overlooking the fact that we fail to show up in big games. Our O line won't dominate until we recruit more & better at those positions.That WR just wanted it more than our safety did is my only explanation for that play. Yes our D has to be the biggest letdown so far in 2012. And yes I miss Savid Greene & Matt Stafford. This shift in power has happened because of one player. Marcus Lattimore.